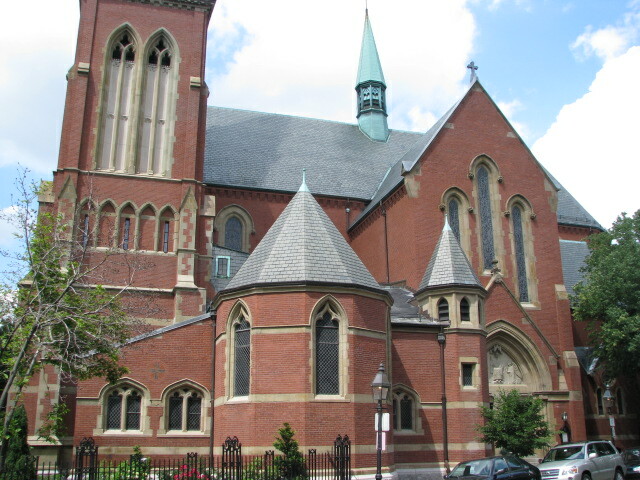 Church of the Advent, an Episcopal church on Beacon Hill in Boston, MA, was designed in 1875 by John Hubbard Sturgis in the Early English Gothic Style. The building was completed in 1888. Ralph Adams Cram (1863-1942) of Cram and Furguson, Architects, a prominent Gothic Revival architect at the turn of the century, designed for Advent the Lady Chapel (1894) to the right of the chancel, the reredos of All Saints Chapel (1907), the Great Rood (1925), and the West Portal (date?). 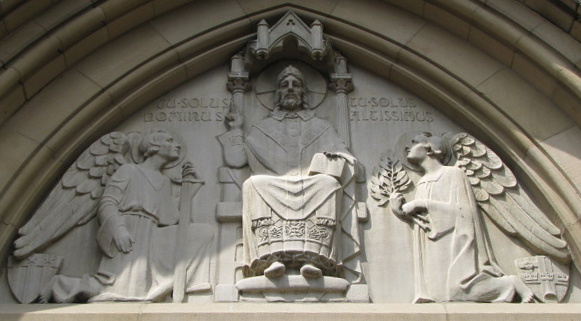 The relief in the tympanum of the portal was the gift of Charles H. Fiske, created by Frederick Warren Allen in 1931 under Cram’s direction and installed over the double doors on Mt.Vernon Street in 1937. Architect Ralph Adams Cram also designed Cole Memorial Chapel at Wheaton College where Allen was commissioned to do a large stone memorial tablet and a portrait relief of the first Mrs. Cole. Both Cole Memorial Chapel and Church of the Advent are classic examples of Cram’s celebrated architecture. Symbols: Two shields in the lower corners, the one on the left decorated with a wide band enclosing three stars above three vertical stripes. The one on the right presents a Greek cross, a wide cross with arms of equal length. Three crowns embellish the horizontal bar and a heraldic horn the vertical bar; in the upper left corner is another small cross, the design evoking the symbolic shield of the Episcopal Church . 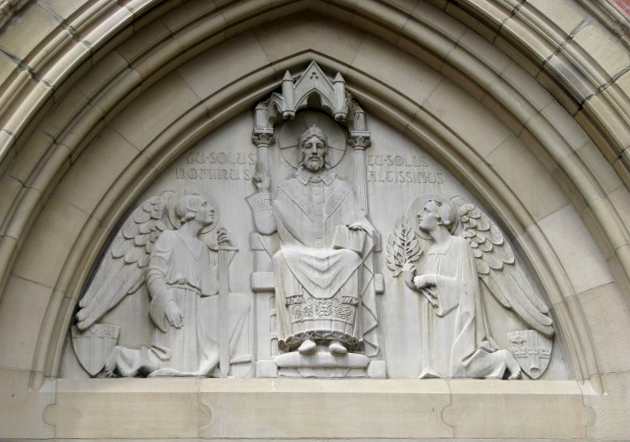 Christ is enthroned on a cathedra or bishop’s chair, his head protected by a canopy or baldacchino, a symbol of power. The canopy is simple architecturally, of roof gable construction without tracery or ornate spires. A gothic arch with a trefoil design is housed within each of three pointed gables joined by four short spires. The largest gable has a trefoil at the peak. The two spires connected to the back of the throne are supported by two fluted columns with sprouting capitals symbolizing life everlasting. The construction detail is like this church and many of Cram’s other religious buildings (ex.Trinity Episcopal in Princeton, NJ 1914 or Gale Mausoleum in Troy, NY 1914). The architectural details, gable shapes, vertical elements, simple spires and trefoils are all elements repeated in the windows, turrets, spires and roofs of the building. 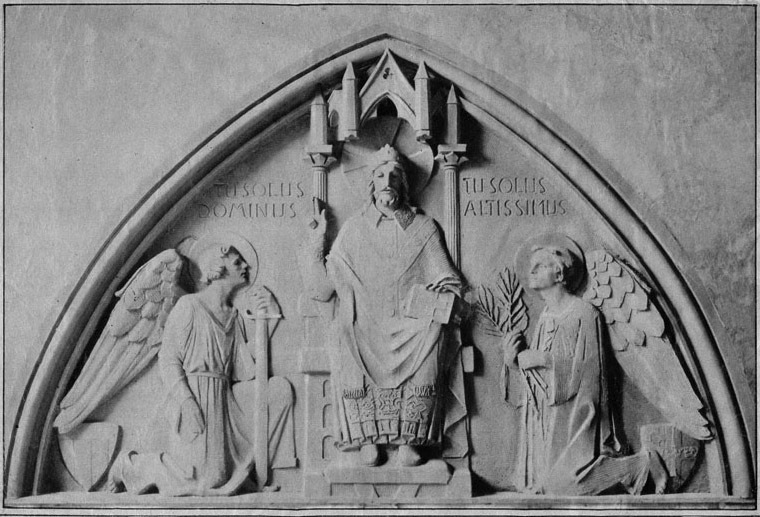 The pose of the dominant figure is that of Christ in Majesty, which had become a standard carving used in the tympanum of a decorated Gothic church portal. Christ sits facing forward in the center of the composition as ruler of the world. His right hand is raised in a blessing and his left hand is holding the Gospels that point the way to life. His knees are apart with his garment stretched in folds between them and his feet in soft slippers are raised on a cushioned footrest. Behind his head is a cruciform halo. The outer liturgical garment worn by Christ is a chasuble, the vestment worn by clergy for the celebration of Holy Eucharist. In Gothic style, the orphrey or ornamental bands, are Y-shaped, a form found in England and Northern Europe. Underneath the chasuble is a white tunic called an alb, with a cincture at the waist and a stole held in place by the rope or tie. Decoration at the hem of the alb varies. Here the embroidery is ornate befitting a king. The stole indicates that the wearer is ordained clergy, the fringed ends originating in the prayer shawls of rabbis, indicating authority. The ends of the stole are plain here, but they may also be embellished. Tradition dictates that the stole be coordinated in color and style with the chasuble. At the neck there is a white linen amice that looks like an embroidered collar with ribbons that cross over in front to secure it in place. The practical purpose was to protect the costly garments from perspiration stains; this amice is an ornately embroidered example. As is common in Christ in Majesty iconic images, he is flanked by other spiritual figures, here in the personages of the angels Michael and Gabriel. Michael at Christ’s right hand is the protector and the leader of the war against evil; thus, he holds a sword. The shield behind him in the corner is the American flag symbol for those who fought and died in the war. He wears a belted, loosely gathered tunic with a v-neck. Gabriel is on Christ’s left hand, holding leafy branches from paradise. The shield behind him/her has a heraldic horn on the vertical member of a Greek cross symbolizing his function as messenger of God and the annunciation angel, and on the horizontal member three crowns symbolizing the royal authority of the king of kings for whom the angel is a messenger. Also, when Gabriel blows his horn, it’s time for Judgement Day! He wears a robe-like garment with a ribbed cuff and loose ties falling from a square neckline. The composition is simple and rather formal, intended to be seen from below, looking up. The relief elements must be clear from this vantage point so there is more of a focus on the details at the middle and upper parts of the tympanum and a subtle repetition of the cruciform shape. Seen from across the street or at a distance, the elements are strong enough to form a geometric pattern. 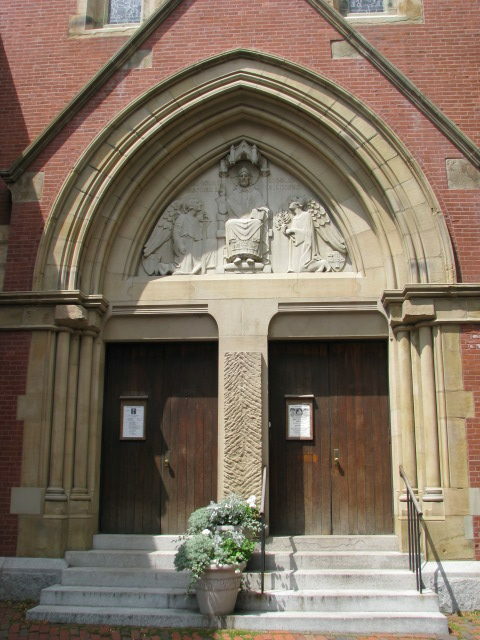 Created in the Gothic style of the building, the composition of the tympanum fits the mood of the uplifting spirituality found within as well as the architectural elements without. Allen believed that architecture and sculpture were two allied arts, each depending on the other for augmentation, the sum of the whole being greater than the parts. The central figure dominates in all ways raised in splendid garments with the two kneeling angels subordinate in position and raiment. The upright kneeling angels repeat the verticality of the throned figure. The trio repeats the trio of tall narrow stained glass windows under the taller gabled side of the building, stepped back behind the shorter entryway. The central shaft created by the verticality of the throne carries up through the ornament at the center of the roof above it and then up through the central window to the cross at the peak of the tall face of the building. All the elements are integrated and harmonious. Stylistically, note the changes between Allen’s original clay pictured in the news clipping and the finished carving. Allen’s style was naturalistic and modern, but he understood that modifications and compromises are necessary in collaborative work. The figure of Christ is essentially unchanged, although the proportions are somewhat different, the central element slightly wider and taller which makes him bigger in a very subtle way. In proportion, then, the height of the spires and gable peaks in the baldaccino have been shortened. His face is also stronger and more stern in appearance. The book he holds no longer has a cross on the cover. His feet seem larger and protrude over the edge of the cushion, which has become plumper in the middle. The orphrey is more detailed and prominent down between the knees and on the chest. 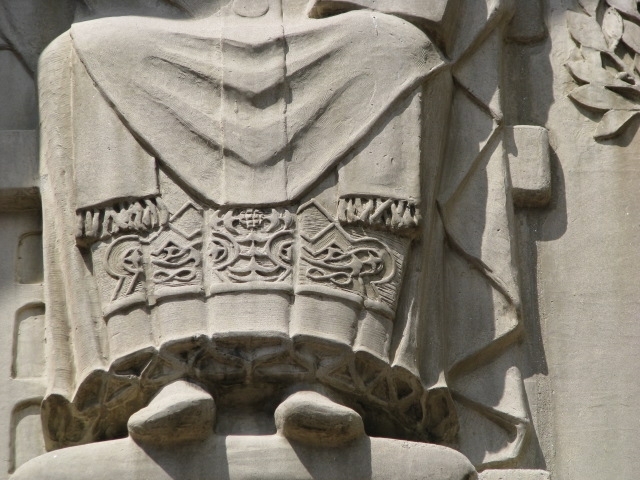 The pleats of the hem are more formalized and crisper as are the folds of the chasuble on his left where the cloth falls in a more even zigzag fashion. Notice the difference between the two pictures in the space between Michael’s shin and the throne. On the other side, Gabriel’s branches have changed and curve upward to provide more verticality and separation from the throne. Look at the faces and the hair. In Allen’s original, Michael has a look of awe on his face with his lips slightly parted and his bone structure softer. Gabriel is gazing outward in a dreamy way with his head slightly turned to his left side whereas in the final version the two look more alike in the structure of the face and have the same upward lifting of the chin, both with eyes clearly looking at Christ’s face. Gabriel has also become slightly taller and more erect when compared to Michael. The hair is more stylized on both. The wings have been changed to a more formal design, rounded at the tips and arranged in parallel lines. On the original, note that Gabriel’s wing tips cross over the frame of the architectural arch near the base bringing the viewer into the space, and the wings of both angels where they meet that arch have been shaved back evenly along the arch. Gabriel’s garment no longer has the loosely ruffled tie at the chest, but rather a squared formal cross with the folds in the garment neater in front. Lastly, the style of the lettering has changed from a simpler, more modern block style lettering to a curved Gothic style. In the memoirs written by Agnes Allen, she mentions that Allen made a door for Cram (probably meaning this tympanum over the door). When he came to see it, he saw the Pediment of Archers that Allen had made (no images) and “went into ecstasies over it. That pediment was exhibited once, but there are no photographs or drawings available. Cram said that he would like work done with the same “crispness and life” he saw in that work. The times had changed and the demand for pediments faded with the other arts as the country headed toward another war. 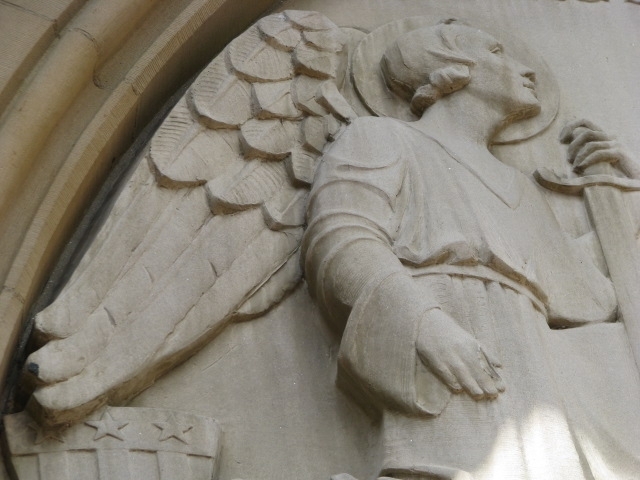 The church has maintained the stone relief with the help of the Building Conservation Associates. Nevertheless, sometimes you’ll see birds nesting in the canopy above the throne. For a man who wasn’t sure he believed in God, people have commented that Allen made the most beautiful angels!